This year the Parade will include five evening banquets. The Pirelli Welcome Party, scheduled for Sunday, July 9, will be held outdoors at the Riverside Terrace of the Spokane Convention Center, just across the street from the hotel. The Porsche Concours Banquet is scheduled for Tuesday, July 11 and the Reliable Carriers Victory Banquets is scheduled for Saturday, July 15. Both will be held in Ballroom 100 at the Spokane Convention Center. We will meet at the nearby Northern Quest Resort & Casino in Airway Heights for the Mobile One Checkpoint Rally Banquet on Wednesday, July 12. The Michelin Late Apex (Autocross) Banquet will be held at the Davenport Grand Hotel on Friday, July 14. Free evenings are scheduled for Monday July 10 and Thursday, July 13, to explore the culinary delights of Spokane. 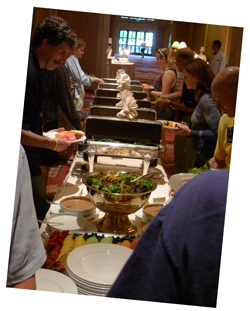 Welcome Buffet Menu: A sampling of each food selection will be available at buffets. Duel Entrée of Seared Salmon & Tri-Tip Steak with Huckleberry Beurre Blanc WA served with Roasted Potatoes with fried Shallots, Brussels Sprouts.